Very Good. Flat Stanley is back! 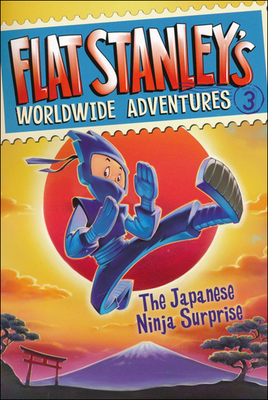 But whoever heard of a flat Ninja? Stanley and his brother, Arthur, are such huge fans of the ninja movie star Oda Nobu that they decide to send him something even better than fan mail-Stanley himself! Soon enough, Flat Stanley is in Japan, seeing the country with his idol. But when trouble surprises them. Illustrator(s): Mitchell, Jon. Series: Flat Stanley. Num Pages: 112 pages, b&w line illustrations. BIC Classification: 5AF; YFB. Category: (JC) Children's (6-12); (JN) Preschool (0-5). Dimension: 135 x 196 x 8. Weight in Grams: 114. Good clean copy with some minor shelf wear. 2011. UK ed. Paperback.....We ship daily from our Bookshop. Very Good. Flat Stanley is back! But whoever heard of a flat Ninja? Stanley and his brother, Arthur, are such huge fans of the ninja movie star Oda Nobu that they decide to send him something even better than fan mail-Stanley himself! Soon enough, Flat Stanley is in Japan, seeing the country with his idol. But when trouble surprises them. Illustrator(s): Mitchell, Jon. Series: Flat Stanley. Num Pages: 112 pages, b&w line illustrations. BIC Classification: 5AF; YFB. Category: (JC) Children's (6-12); (JN) Preschool (0-5). Dimension: 135 x 196 x 8. Weight in Grams: 114. Good clean copy with light wear. 2011. UK ed. Paperback.....We ship daily from our Bookshop. Pamintuan, Macky. New. Library binding. Contains: Illustrations, black & white. Flat Stanley's Worldwide Adventures, 3. Intended for a juvenile audience. Very Good. 0606071407 Minor shelf wear.